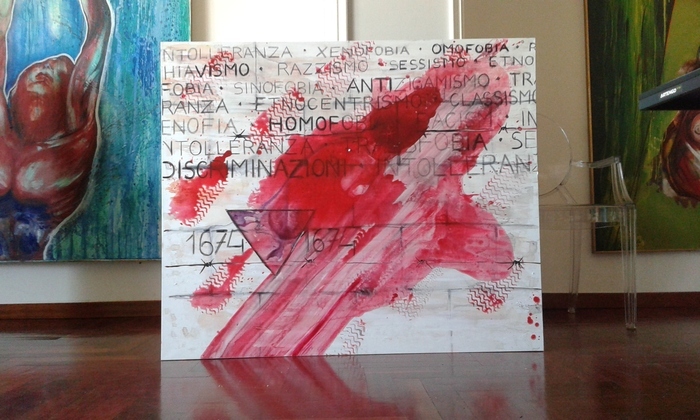 VALERIA ANGELINI,name of art acquired by grandfather Sergio Angelini. Valeria Maggiolo:i was born the September 14, 1969 to Massawa in Eritrea. I have moved to Rome, Italy in 1977 as a result of the ongoing war between Eritrea and Ethiopia with my family. Rome, my adopted city, where I studied and i have been able to develop my artistic interests, by attending the courses in painting of Prof. Brunori at the Accademia di Belle Arti. Since 2000 i live and work in Seregno(Mb) ,i have two children Isabella of 14years and Nicolo 12years. 15/18.05 2015 ROMART. Biennial of art and cultur. Rome Italy. From 2007 to 2013 i brought forward a creative project with my brother Massimiliano(fashion designer); caring together the embodiment of a company that produced a line of clothing women's sartorial. 3.7 The 10.10.2008 Gallery Camaver Kunsthaus in Sondrio- collective of contemporary artists. 13/30.10 . Gallery 2007 Camaver Kunsthaus in Lecco- collective of contemporary art. 04.13.2006 Teatro Dal Verme Milan collective- sponsored by the City of Milan is organised by the Rotary Club "Milano Scale" and Associations for Alzheimer's disease within the scope of the event" great Easter Concert". 1999.2000 Permanent art works exhibited at the Gallery White Gold via the Advantage in Rome. France) International Tour of Contemporary Art, organised by the Gallery Meetings of Cesenatico(fo). 20/05.26.1995 First International Art " Biennale" Malta Valletta. 08.20.1989 Flowers of the Valley del Tronto, Painting exhibition organized by the newspaper "The messenger" of Rome 1ST Prize. Description: Last part of the trilogy by title" and blame that sonofabitch of Eva". Closes a pictorial discourse began in 2006: three paintings lived as need to materialize/ exorcise a period of my life, an important step. The expectation, the fall (the dark), the rebirth ( the light). The slow ascent, hard to get up from the mud. Blame that how fucked Eva scapegoat of our discomfort, ancient and modern. Made of flesh and blood, the body takes abstract forms, contorted, elongated, misrepresented, expressive medium: ideal container which encloses emotions, memories, feelings of the past and the present. Matter that is sculpted and follows my thoughts, my feelings. Fills up like a jar and then emptying and filling again: pain, fear, happiness become color. Color that makes visible the invisible. The figure extends upwards by lengthening the arms exaggeratedly to arrive to grip the ball. The cascade of light floods magically figure which regenerates of new life. The rise has need of lightness, has left at the bottom of the stomach the sign, the track, not to forget.